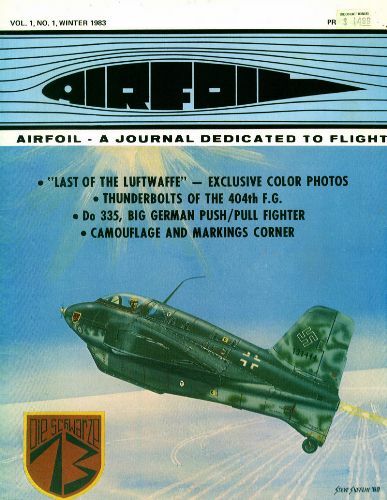 'Airfoil' magazine was published once a year from 1983 to 1987, so only 5 issues were ever made. They were published by S. W. Sheflin and associate editors R.P. Lutz Jr., Jim Crow and Steven Blake, all well know German aviation historians. The cover below is that of the premiere issue, and it features photos taken by US and foreign troops during the war or shortly after. The caption of cover illustration reads as follows: Me 163B Komet "Die Schwarze 13" of JG 400, is depicted in operation over Brandis, Germany. This craft was found by the Allies at Polenz, which was a dispersal area for the main Brandis airfield, where it had been blown up by the Germans. The camouflage was Brown-Violet 81 and Dark Green 82 over Light Blue 76. Note the extensive use of standard red primer. The W. Nr. 191444, is provisional.